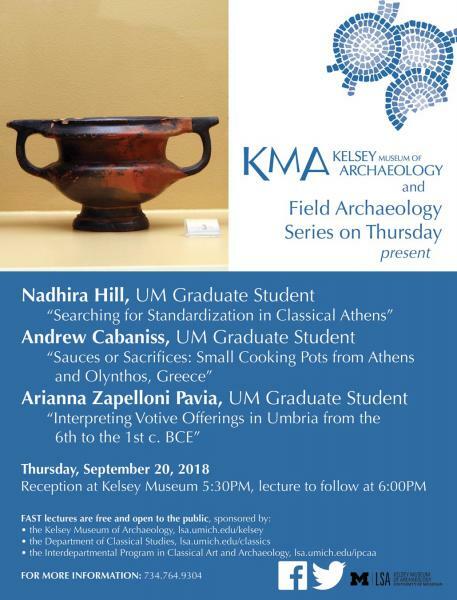 - Nadhira Hill, "Searching for Standardization in Classical Athens"
- Andrew Cabaniss, "Sauces or Sacrifices: Small Cooking Pots from Athens and Olynthos, Greece"
- Arianna Zapelloni Pavia, "Interpreting Votive Offerings in Umbria from the 6th to the 1st c. BCE"
Reception at Kelsey Museum 5:30PM, lecture to follow at 6:00PM. If you are a person with a disability who requires an accommodation to attend this lecture, please contact the education office (734-647-4167) as soon as possible. We ask for advance notice as some accommodations may require more time for the University to arrange.